Are you familiar with the Bernick’s inbound tale? If not, then you’re in for a treat. Bernick’s is a family-owned distributor located right here in Central Minnesota; established in 1916, they have over a century of experience in the industry. But with time comes change. And over the years, Bernick’s has adapted to the swift shifts in business that have arisen. 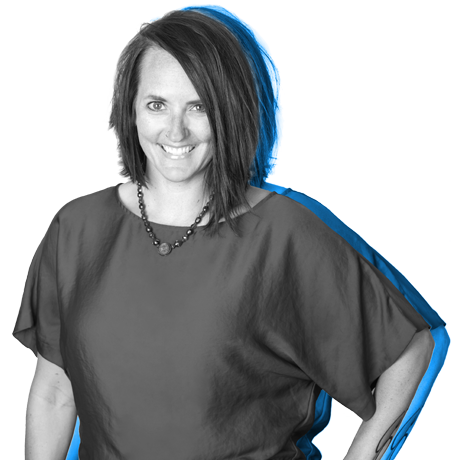 From old-school traditional marketing to the face of inbound, their team is always ready for a new challenge. It’s one of the many reasons we value their partnership with us. They trust us; that's the beauty of client-agency progression and the true mark of success on both parties' behalf. Backtracking to one of their largest obstacles to overcome, let’s throw it way back: it’s 2014. Around this time, Bernick’s was looking to partner with a marketing agency that would help them launch their new website and take their marketing efforts to a whole new playing field. At this time, they weren’t familiar with what “inbound marketing” meant. But after meeting with us and learning why this new generation of doing business was crucial for their success, we had them intrigued ... to say the least. Since Bernick’s launched their new site back in 2014, they saw their numbers grow. And we’re not talking about a few-digit increase. This was no joke; in one month, their number of website visits increased by 1,858 percent. Yes, you read that correctly. This pathway on their site opened so many new doors for them. They were no longer thinking they were contacting everyone. People were reaching out to them. Old customers were returning. Even leads who were conducting business with their competitors were seeing what the Bernick’s vending and distribution company was all about. And here lied the new challenge. The new leads had changed. People were coming to the new site to look for something specific. And when Bernick’s launched their website, it was a free-for-all. Leads are always good, but without a proper process on the receiving end, chaos was sure to ensue. Which verticals and geographic markets needed better ID'ing internally? 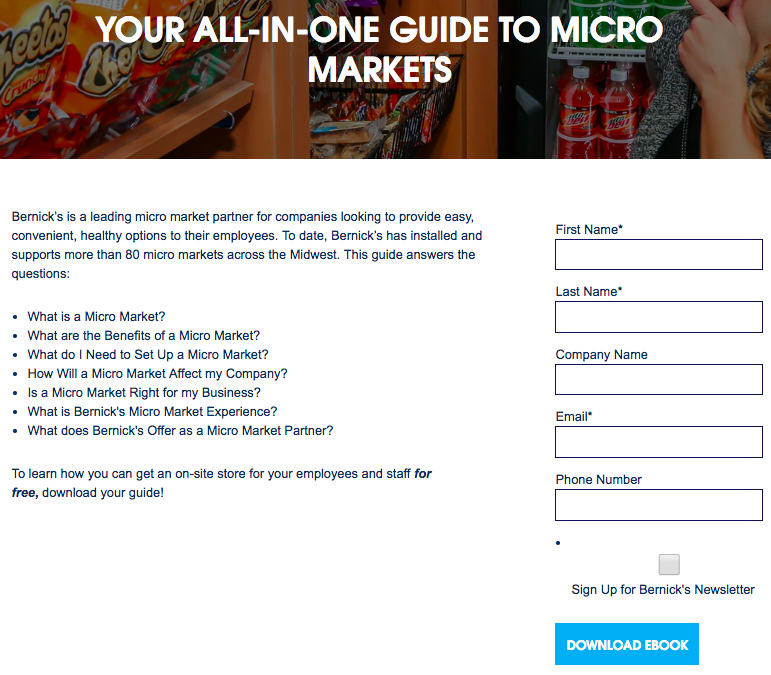 How would the Bernick's team distribute leads for micro market or vending requests differently from soda, beer, or requests for community donations? This new challenge meant that we all needed to hit the drawing boards. Bernick’s has utilized some of HubSpot’s stellar features since day one. Landing pages (LPs), forms, call-to-actions (CTAs), email marketing, reports, campaigns — you name it. But now in the last 12 months, we’ve all decided we need to focus on three major areas to tackle the new-lead problem. For Bernick's, lead generation can act like drinking from a garden hose. We wanted to help give their brand the ability to get a little more narrow and a lot more focused on leads. Think of the new strategy as drinking from ... well, a drinking straw. Bernick’s has had campaigns running since the beginning of our partnership. These have helped entice consumers to take action. CTAs were clicked on. People were reading their blogs. But it wasn’t fully tailored to the need of the company’s buyer personas - and the company has more than a few considering their wide line of business initiatives. Hey You There. Like What You See? Just take a moment to read this again. It moves you. It motivates you. And if you’re a dietician, you’ll be directed to content catered for your needs — not just some general eBook or some other guide. It's suddenly as if Bernick's was hand-delivering custom, tailored to your needs as a dietician! Bingo. Businesses trying to step up their company culture game are sure to take notice. This LP is just for them — pushing them further along their buyer’s journey. Whether you’re looking to distribute your product or bring a micro market straight to your office, this fresh new look above makes it simple. It allows you to get sent down a tailored journey — ultimately leading you to your end goal as a consumer. Slow your scroll; you have everything you need above the fold ... just select where you want to go. Bernick’s had become curious about other opportunities in HubSpot. The marketing automation platform is always coming out with new features to better connect your organization and get closer to the end goal. And with their sales funnel process, Bernick’s realized there was some miscommunication between the sales and marketing departments. You know how it goes. A marketing team gets the leads and enters the information into their customer relationship management (CRM) tools. Later that day, a salesperson goes in and manually moves the information into their different CRM program. The method is cumbersome and inefficient. Not only that but time and time again vital info. about your leads is lost in the process. In 2018, Bernick’s knew it was time to truly combine forces with sales and marketing departments. It's not unlike getting all the Pepsi and Diet Pepsi fans to align under the same notion that yes, you have different preferences, but you can still hold true to your staunch favorite while co-mingling for the greater good of Bernick's. This past year, Bernick’s fully immersed themselves with HubSpot’s CRM to connect the sales and marketing processes. Now, everyone was under one roof — and the results are just what you would expect. Bernick’s wasn’t messin' around when it came to their sales-qualified leads (SQLs) efforts. In 2018, they captured 371 SQLs. Half a million dollars in one single year? Yeah, they really weren’t messing around. Bernick’s generated $515,795 just from inbound alone. In total, the company has brought in $1,610,400 since embracing inbound marketing — talk about a real commitment to inbound. The new efforts to provide more tailored content and lead nurturing paths for consumers is why nearly one-third of their overall inbound profits have come from the 12 months. 48? Yes, as in 48 months. Through four years of inbound marketing commitment, from the first time the word “inbound” was introduced to now, Bernick’s has kept their end of the deal. They listen. They care. They believe. And Bernick’s collaboration with our team at Leighton Interactive has helped them see astronomical changes in how they do business — through their website, contacts, blogs, and more. Below are the long-term numbers more in-depth; we’re talking about from year one to now: 48 reasons to believe. Those are impressive numbers. Website sessions increased by 74 percent, contacts increased by 208 percent, blog views increased by 493 percent, and organic traffic increased by 82 percent. Overall, the revenue from Bernick’s inbound marketing efforts has increased by 256 percent. 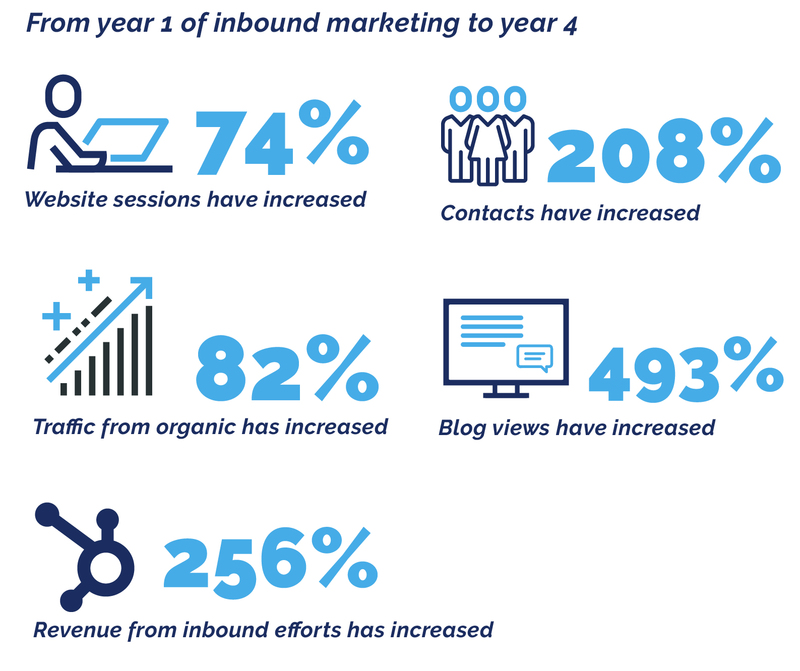 With these changes to a more focused content and lead-nurturing method, it’s no wonder around one-third of their overall inbound revenue since 2014 has come from this past year. And Bernick’s knows this is just the beginning. That’s why they’re still always pushing boundaries, always growing. Bernick’s continues to strive to be greater — both as a business and as a community role model. They’re not just your average business-to-business (B2B) organization. And they know the way to reach consumers is not through just their B2B buyer persona. Bernick’s utilizes its outlets to provide more for their consumers than just what their initial buyer persona says. Sure, buyer personas are a vital piece to a successful business. But the specific persona may only tie to an individual on a professional level — like their position as a district manager. She may be a manager who wants to provide a micro market for her office, but she’s also a soccer mom with kids. This is their ‘2nd person,’ if you will. It’s the part of them that you don’t always notice or think to consider, but it’s just as important. Bernick’s also understands the importance of business development and culture. That’s why in 2018 they reached out to us for a new opportunity — to help them establish and execute their business acquisition plans. Leighton Interactive has helped them portray their message to the public for press releases. We’ve worked with them on how to effectively communicate with their new employees. Even the website and social media changes have been effectively conveyed. Bernick’s took a leap of faith with yet again on this new endeavor; it’s been worth it. And it has worked out beautifully, just like every other aspect of our dynamic inbound relationship. No, it’s not the type of marriage that first comes to mind. However, the important things are at play — like our commitment to each other. Since the very beginning, Bernick’s has been all-in, 100 percent onboard with the inbound life and our Tribe. And they’ve grown with us and support our team over the years. Bringing us to the present day, Bernick’s will be one of our sponsors for our One Squared 2019 event. Yeah, they love the inbound life as much as we do. It’s why we’re thrilled to continue our partnership with this incredible organization.